Yes. The fair isle tam aka Thrift Hat by Outi Kater is pretty much completed. It’s been blocked and is now drying nicely on my home made tam stretcher. I wrote pretty much because it still needs either a pompom or a little tail on top – like a traditional Béret. The lady who commissioned me for this tam wants a pompom, I kind of like the look of the béret tail better, but I have made the pompom and am happy to add it on. 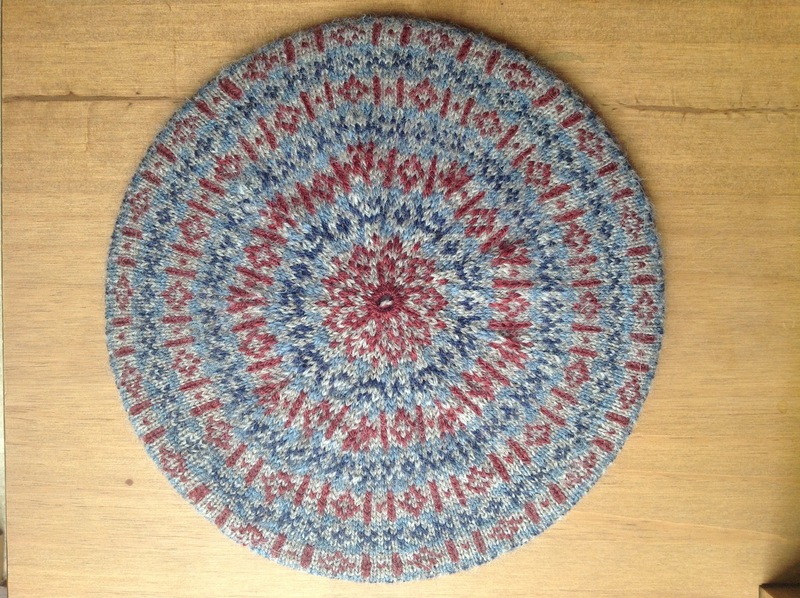 I still need to put together a booklet to go with it, to tell the story of the hat – from fields to head – as it has been knitted entirely with locally grown and organically dyed wool. I will share more photos of this hat once it’s all dry, pompom’d and ready to go. I just wanted to share with you the first glimpse. That is exceptional knitting, Noemie! I am sure it will be a treasured gift. I know as a former teacher that it would have been a highlight among the gifts I received. Perfect knitting and how wonderful to call it a wearable Mandela! Hooray, I know you could do it! It looks great! I thought about you a lot while doing it, wondering if you too were sometimes getting a bit stressed with deadlines and falling behind… ? Ces bérets sont vraiment très réussis, tu dois essayer d’en faire d’autres encore, pour le bienfait de l’humanité oui oui OUI !!! Tu es investie d’une Mission maintenant ….